Microgrids are the keystone as we move toward use of more distributed energy resources (DERs). And they offer a variety of ways to increase your facility’s resiliency, efficiency, and sustainability. But how does it all work, and how can you use this technology to optimize your current existing operation? The report explores how to connect on-site generation and storage assets with traditional grid energy, and delves into specific microgrid technologies. Microgrids. We often think of them as a group of independent functional componants. But according to the report, they often result from the association of subsystems acting in coordination. These systems include sensors, meters, and network protection, controls at the distributed energy resource (DER) level, and more. There are also specific constraints for this protection strategy. In fact, microgrids bring up new challenges from protection system designs because of the association of local distributed generation and capability to island from the main grid. 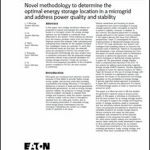 Schneider Electric covers a variety of microgrid operating modes in the recent report, including when energy is supplied by the grid only, as well as by a local energy source and storage, and how to address specific challenges within these modes. Specific performance objectives have to be solved through technical advances in systems’ control and protection innovation such that cooperation of distributed energy resources toward a shared objective can be fulfilled. And when adopting any new technology, businesses must address the question of quality – in this case, power quality. Since microgrids balance energy generation and demand in real time, “this requires fast and accurate measurements of active and reactive powers, frequency, current, and voltage levels in order to enable proper power quality control and automated operation.” Some of the most important power quality measures include harmonics, frequency variations, transients, and voltage sags and swells. 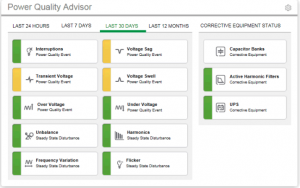 Power Quality measurements are key to assure microgrid control, reliability, and standard compliance. Power control is particularly important for stability. And stability means protecting against non-controllable issues that can arise from short circuits, motor starts, load changes, and more. Therefore, to retain stability, one must understand how the DERs interact with each other. Lastly, the report covers optimizing energy flows and energy control for optimization. This is especially important because a microgrid controller is responsible for overall system operation. There are several technical solutions to implement an effective microgrid controller using a distributed microgrid controller, or a central controller, or a mix of the two solutions, the specifics of which are covered in the white paper. Ultimately, major technological advances made the way for microgrids. Now, with the progress made in furthering decentralized energy resources, new optimization and cooperation capabilities have surfaced. 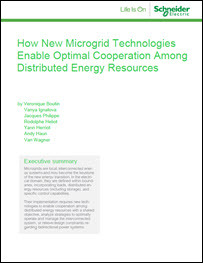 To learn more about how microgrids can combine, connect, and optimize DERs, download the full white paper.